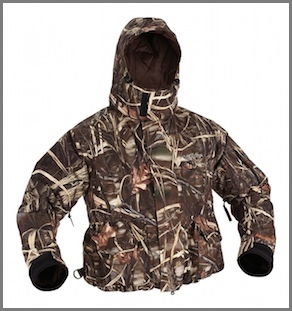 The jacket offers a full front zipper with snap storm flap, and double reinforced speed pockets for quick and easy access to shells. The jacket also includes fleece-lined, hand warmer pockets for those extra cold days. The non-slip shoulders keep your gun or binoculars from slipping off your shoulder. The underarm zippers allow for convenient ventilation for when the weather turns warmer.